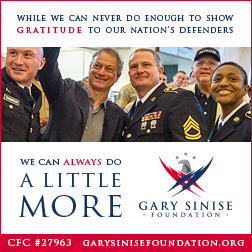 The Gary Sinise Foundation serves our nation by honoring our defenders, veterans, first responders, their families, and those in need by creating and supporting unique programs designed to entertain, educate, inspire, strengthen, and build communities. On July 25, 2012, during his third deployment, US Army Master Sgt. Cedric King's platoon was conducting a reconnaissance of a possible explosives distributor in Afghanistan. After a firefight with the enemy, Cedric stepped on a pressure plate improvised explosive device (IED). The blast lifted him from his feet. In that moment, Cedric wondered if he would ever see his family again. He awoke eight days later to find both of his legs amputated and his right hand severely disfigured. His wife and mother were at his bedside. Since completing his three-year long rehabilitation at Walter Reed National Military Medical Center, Cedric has run marathons and climbed mountains. But upon returning to North Carolina, Cedric found his most daunting obstacles in his very own home. "Living there presents challenges like climbing and descending stairs," he said. "The doorways prevent me from going into certain rooms in my wheelchair." In April 2016, the Gary Sinise Foundation broke ground on a specially adapted smart home for Cedric. With amenities customized to his needs, the house will increase his self-reliance and ease the responsibilities of his caregivers and family. The life-changing home will mark a new beginning for Cedric, his wife, and their two daughters. Cedric's remarkably positive attitude is an inspiration. For his talents as a motivational speaker, he was appointed to the Gary Sinise Foundation's Ambassadors Council. Today, Cedric travels the nation raising awareness about the Foundation and sharing his incredible story. "The one lesson I can give about life," he says, "is that we are created to do things that far exceed our own expectations."